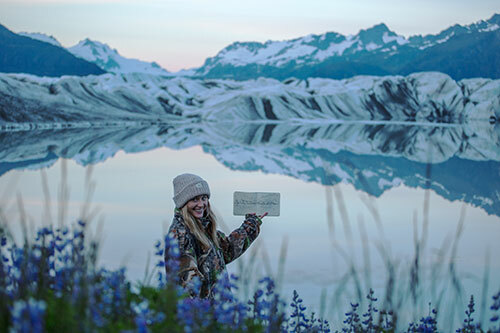 A student and faculty with the University of Oregon School of Journalism and Communication's Science and Memory program canoe into the shadow of a glacier in pursuit of a story. Photo by Dan Morrison, courtesy of Science and Memory/University of Oregon School of Journalism and Communication. It’s late in the day, but at the 60th parallel in July, the sun still hangs high. 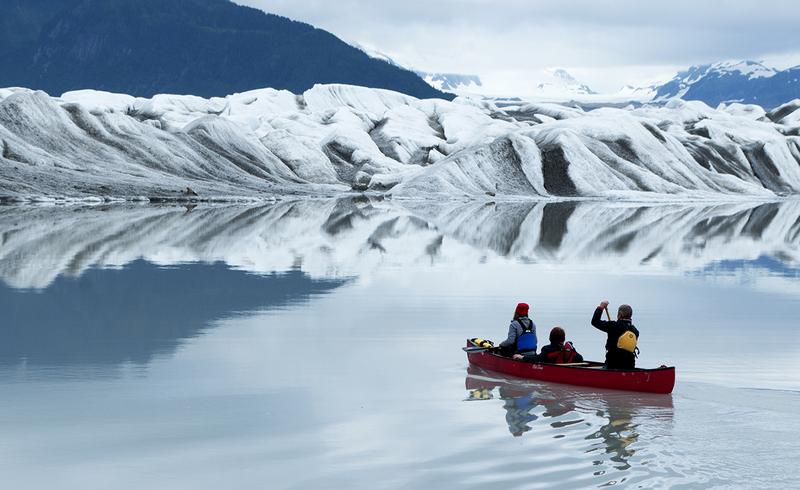 A canoe slices slowly through the watery reflection of a mountain of ice looming ahead. The boat carries its passengers through a narrow passageway and into a silent cavern. Sheer blue walls rise up on all sides, bringing to mind a grand cathedral. But this is no manmade structure. Sheridan Glacier has sat for millennia near this spot, about 25 miles from Cordova, Alaska. It seems ancient and unmovable, but like the boat, it too is moving slowly. In fact, the pace of the glacier’s change has increased exponentially in the past few decades, with potential consequences more dramatic than the still waters surrounding it would suggest. In the canoe sit Mark Blaine and Torsten Kjellstrand, faculty members with the University of Oregon (UO) School of Journalism and Communication (SOJC). As they gaze up at the uneven aperture of sky above, a small drone hovers into view. The drone’s operator, SOJC senior Evan Norton, has spent all week using this cutting-edge tool to capture spectacular footage. Norton is one of more than 75 students who have traveled to Cordova with Blaine, Kjellstrand and their colleagues Deborah and Dan Morrison over the past two years for the UO SOJC’s Science and Memory project. 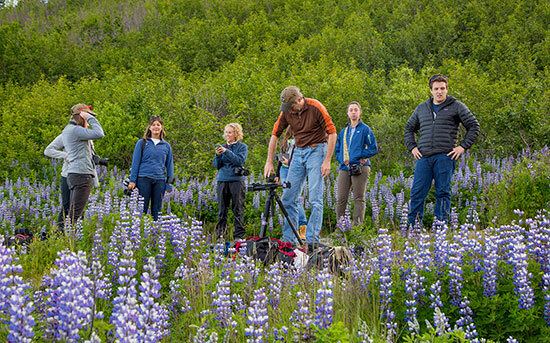 In sites around Oregon and Alaska, these students learn how to report on complicated scientific topics while they explore the wilderness, collaborate with researchers, interview salmon fishermen and native Alaskans, and work long hours in harsh conditions. 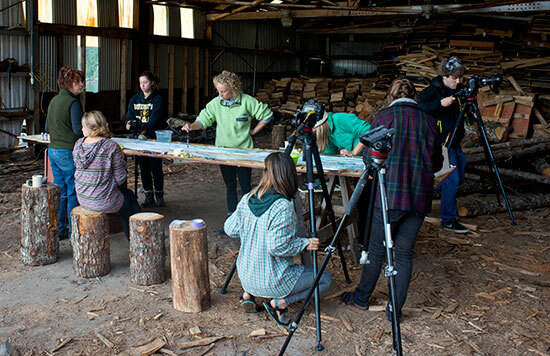 They blog about the effects of climate change they witness — both ecological and economic — and tell innovative multimedia stories based in research and science. For SOJC students and faculty alike, the experience has been transformative. Of all the conundrums facing science today, climate change is perhaps the most frustrating. To reverse the alarming trends scientists see in the data, they must convince much of the population to change its ways. But to reach people already overwhelmed by daily life, a glut of conflicting information and persistent belief systems, they need more than data. They need story. This is where journalism comes in. A good science reporter can transform dry facts into an emotional experience strong enough to change minds and habits. A prime example of this experiential learning project’s unique brand of science storytelling is “Will You Change?,” a student-produced video that was shortlisted at the 2016 One Screen Film Fest. The piece combines spectacular footage with watercolor paintings created onsite by student Taylor Richmond. In the stories of Science and Memory, the land is both a character and a plot point. No roads lead to Cordova, a salmon fishing town at the mouth of the Copper River Delta. The only way in or out is by boat or float plane, and no one comes here without a reason. For most of the town’s 2,200 residents, that reason is the salmon fishing industry. Ever hear of Copper River salmon? They come from Cordova, one of the most valuable fishing ports in the country. In addition to adventure tourists, Cordova draws scientists representing a variety of interests. 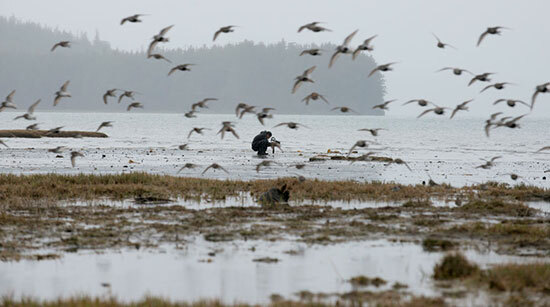 The Alaska Fish and Wildlife Service monitors the salmon population. The federal government sends in the National Oceanic and Atmospheric Administration, U.S. Geological Survey and U.S. Forest Service. Settlement money from the Exxon Valdez spill, which happened nearby, contributes to the local Prince William Sound Science Center’s research. Even the tribal elders of the nearby native village of Eyak have hired their own scientists. Blaine and Dan and Deb Morrison piloted Science and Memory in 2013, when they used a small Forest Service grant to take one student to Cordova. Since then, the group has raised funding from a variety of internal and external sources, including the SOJC’s Agora Journalism Center, The Boiler Family Fund for Experiential Learning and the Nancy and David Petrone Faculty Fellowship Fund, among others. This, plus about $1,500 each student chips in, pays for room and board, van rentals, shipping and gear ranging from camping supplies to high-tech multimedia equipment. Three student cohorts will make the journey to Cordova in 2016: Two Discovery groups will spend 10 days exploring and sniffing out stories. Then a smaller Mastery team of handpicked seniors with serious multimedia chops will spend a month capturing footage and imagery with a more focused agenda. For Science and Memory’s third year, the teaching team is considering acquiring 360-degree video equipment to experiment with immersive media. The program is also expanding its research component, as several other SOJC faculty members want to conduct their own studies in Cordova. And the project team is exploring trips to new locales, such as the Mississippi River Delta, where Louisiana State University recently opened a $16 million modeling facility. In the meantime, the project’s student work has begun to spread far and wide. In addition to the shortlisted film, Science and Memory footage has been featured in UO promotional material, including a national TV ad broadcast during the 2014 College Football Playoff National Championships. The body of work makes for some unique and impressive student portfolios. “Our students have certainly used the imagery to great effect in getting jobs, because frankly, it’s beautiful,” Blaine said. Andra Brichacek is a writer and editor for the University of Oregon School of Journalism and Communication. She has been creating content for print and online media for nearly two decades and has specialized in education since 2008. Follow her on Twitter @andramere.